I have a relationship with Eugene O’Neill, and it has endured over fifteen years. Like some other close friends I have, we live apart. There may be long periods when we don’t see each other. But when we pick up the threads of communication again, the exchange cuts to the chase. Understanding is immediate. We have history. A small photo of him sits on my desk. When my eyes glance over in the course of my days, I subliminally recall important times, the same with other friends and family whose photos sit around my home. But much of the time, his image gets covered over with stacks of papers, shunted off, buried in notes. Our relationship seems to go underground. He made an overt appearance the other day that I’ll tell you about a little later, but first perhaps you’d like to know more about how it all began. It was so significant that I relayed the start and development in my two previous books. In my book Calling Our Spirits Home I relayed a dream that gave me both a warning and a prophecy. Eugene O’Neill appeared in the course of the dream metaphorically compelling me to write and advising that it would become part of my livelihood. It showed me essentially ignoring him and becoming distracted down another avenue. I had this dream well before I considered undertaking the book in question, or even any writing for that matter. I also knew very little about Eugene O’Neill and hadn’t, in my memory, been exposed recently to anything he’d penned. Much later, when I finally decided to write, my attention was indeed split by a venture that proved, in the end, not only disappointing but also distinctly unprofitable. I hadn’t been smart enough at the time to heed his advice. Again, it’s possible that this is just an interesting and coincidental story. But after I had started this present book and was finding all ways imaginable not to write—as writers sometimes do—Eugene O’Neill appeared to me again in a dream. This time it was very brief. But it was a flash I clearly recalled. “I’ll have to go,” he said to me and began to turn away. “Wait!” I cried out desperately, waking myself up. After that I once again picked up my pen, so to speak. A few weeks later, I was cross-country visiting my parents. While there, I had dinner with an old friend. In the midst of our conversation, I told him about my unusual relationship with Eugene O’Neill. We laughed about it and went on to other topics. When I returned to my parents’ home late that night, they were already in bed. Being too energized by my hours long discussion with my friend, I looked for a way to unwind so that I could go to bed. Reading the newspaper is not a habit of mine. However, the newspaper was there and after scanning the front page, I opened it. There staring back at me was a photograph of Eugene O’Neill! In a column entitled “This Day in History,” I was informed that on that date in 1946 “The Iceman Cometh” had opened on Broadway. I also noticed from the article that he had passed the year I was born. I may have been chuckling with my friend earlier that evening, but someone was having a big laugh at my expense then. It was a few more hours before I was able to retire for the night. How is it that I could be the “protegé” of Eugene O’Neill? Or that simple events could arrange themselves in a way that I definitely glean meaning in them for my life? The only answer I have is that at those times when he actively manifested in my awareness, there must have been a resonance of some sort between us. If vibrations are similar, they often attract. I noticed that I saw him only when I was using delaying tactics, or was generally unconscious in my actions. Perhaps in his life, he knew those same patterns all too well. I can only feel deeply touched by his clipped, direct guidance and be grateful for it. I haven’t seen my mentor in a metaphysical manner in quite some time. But writing has become a regular practice for me. Maybe it’s his intense dark eyes staring at me from the newspaper photo that I preserve on my desk that keeps me in line. He’s had no further need to reappear. My illustrations here lend a new meaning to possibility. If something has ever existed in some form, then it’s still present on a certain level. In the instances above, I stumbled upon this truism. But we can consciously open to it. Holding the intent to connect with what would guide us, we can do so. As I noted in Standing Stark, I no longer need encouragement to write. But it’s always nice to be acknowledged and to do the same in turn. Several days ago, I was clearing my desk, throwing out a plethora of notes I no longer needed. The project had come to completion. I had just sent off the last advance copy of my new book Portals to the Vision Serpent to the editorial reviewers. 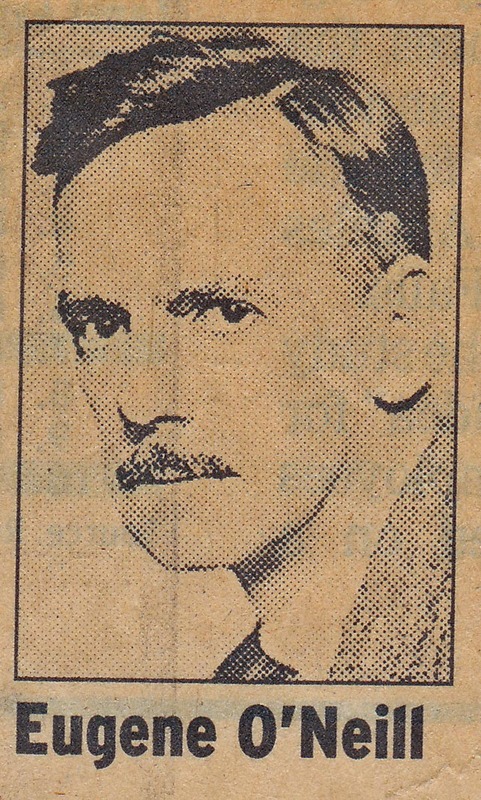 In my straightening up, Eugene O’Neill was suddenly visible again, the photo yellowed with age. Our eyes hadn’t met for a long time, and when they did, I could swear that he bowed his head slightly to me. I smiled and bowed mine in return. Portals to the Vision Serpent is the initiation journey of a young man, carried by faith to fill the gaping hole left by not knowing his people, even as they insistently call to him. The story moves through Georgia, Arizona and into the rainforests of Guatemala and Mexico. Interwoven are the struggles of native people to preserve their way of life and tragedies that often come through misunderstanding between cultures. This is a tale of dark wounds, healing, hope and cross-cultural acceptance. The novel will be published in print and e-book by June. Watch for the announcement.